I’m sure most of us remember the days when the Walkman was all the rage, and everyone could be seen with one sticking out of their bag or attached to their belt. They were the latest tech, and it was something we all had to have. While it may seem like digital music and music players have taken over, there is still a pretty big demand for something a little old school. So, if you find yourself wanting to play your favourite CDs while you are on the move, this could be the ideal place for you. 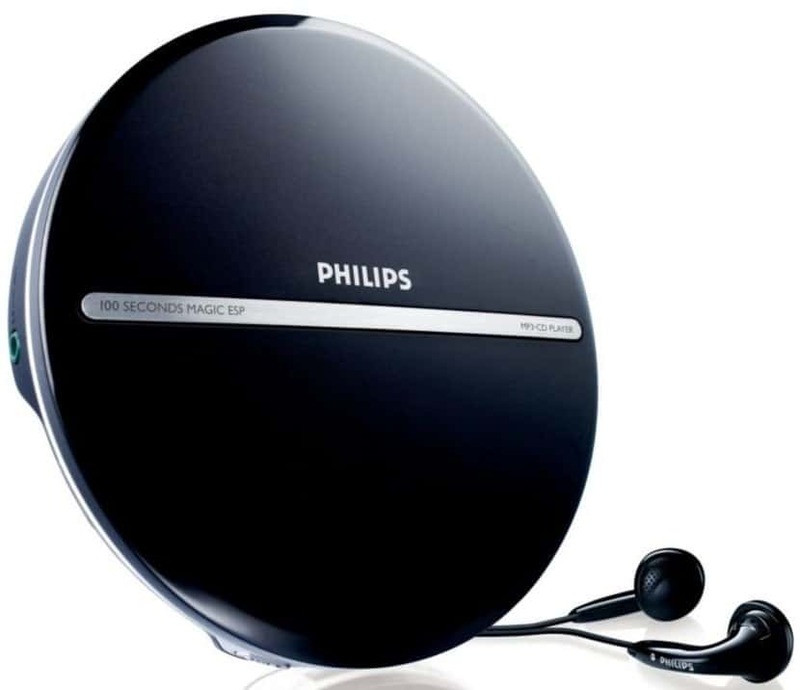 In order to help you find the best portable CD player, we have put this guide together, compiling all of the relevant portable CD player reviews in one place, so you can find something that is perfect for you. What is a Portable CD Player and What is it Used for? The basic definition of a portable CD player is a portable audio device that is used to play compact discs (CDs) while you are on the move, the first of which was released by Sony. A typical portable CD player has several basic features that you are likely to find – whether you are using a Walkman or a stereo. These are: play/pause, stop, rewind, fast forward, headphone socket. The way in which they work is also quite simple. The CD player will read the bumps and grooves in the disc using a special laser. Using its photocell, it will determine whether or not there is a reflection of light given off the CD when the laser hits it. Depending on the reflection, the photocell will return a 1 (no reflection) or a 0 (reflection). The 0-1 data series on the CD is transformed by a digital analogue converter, recreating the shape of the sound wave. With Walkman-type models, headphones are used to amplify the sounds instead of speakers. There are so many types of CD player that it would take several articles to get through each of them in any kind of detail. So, in this section, we will look at some of the main types of CD player to give you a little more information and hopefully to help you find one that will work nicely for you and your needs. The Walkman has long been seen as the poster model for portable CD players. Of course, not every circular CD player is a Walkman – only those manufactured by Sony get the title. However, portable CD players that share the style and basic features of the Walkman still remain one of the most popular choices. These tend to open up at the top for you to place the disc inside, and will have several controls on the lid or the sides so that you can adjust things accordingly. It also has a headphone port so that you can listen to your music. Stereos are also a good choice, and are perfect for taking to friend’s houses or over to visit your family. They aren’t particularly large, but they will gladly take your discs and are lightweight enough to carry around with you. Additionally, they tend to have extra features, like the ability to give you access to radio stations as well as a wider range of controls and features for you to fiddle with. Car Radios are another form of portable CD player, and this guide features a couple of them. You can easily buy models that are suited to every type of car, and they are also able to access the radio – so you have something to listen to if you run out of music. Some of them are even able to use Bluetooth to connect to your mobile device for music streaming as well as taking calls safely when you are driving. Now that you have a little more information on the types of CD player and their uses, take a look at the portable CD player reviews below. Phillips is a leading brand in the technology industry, and they are guaranteed to leave you feeling impressed with any purchase. If you are looking for a good portable CD player on a budget, then this could be just right for you. Have a read below and see. This portable CD player comes in a classic Walkman style and in black with silver details, giving you a sleek and adaptable appearance so that it always suits your style. It even comes with a pair of great headphones so that you can listen to your music wherever you are. The bass boost also provides a deep and dramatic sound that you are sure to love. With one charge, you can enjoy over ten hours of music, and you won’t find that the battery is drained when it is on standby. It has shockproof ESP for 100 seconds, which is ideal for those who like to take their portable players out jogging with them. It also reads CD, CD-R, and CD-RW discs, so every format is just about covered. Some customers have noted that it can be a little tricky to open, as well as difficult to change the batteries. This portable CD player comes at a very low and reasonable price, so you could slot it into your budget with a great deal of ease. While some have found it a little hard to open and change the batteries, it can be done and is certainly worth it for the superb sound quality and the deep bass. Ideal for all situations and durable, this is the CD player of the year, and one you should consider. Q: Does this product have a random/shuffle mode? Q: Does it have usb connection? 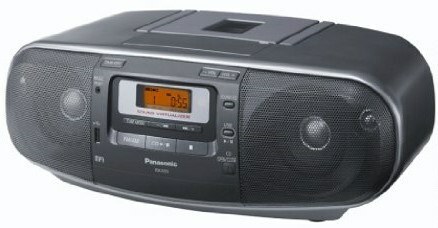 Portable CD players can also come in the form of stereos, and that’s exactly what this model from top brand Panasonic is. If you are in search of something to listen to your music with for under £200, this could be the perfect model for you. Have a look and see for yourself. This stereo comes in black and has a small, portable, design that will allow it to fit into any home – both in terms of size and aesthetics. It is surprisingly lightweight, so you can carry it around with you, and also has a remote control so that you can adjust the volume, switch tracks, and change stations from a distance – perfect for parties, gatherings, or just chilling at home. It is able to play CD, CD-R, and CD-RW discs, allowing you the benefits of every form so that you never have to miss out on your favourite songs. The speakers provide superb sound quality, and it can access FM radio stations. It can even play MP3 files and has a USB port, allowing you to play all of your digital music as well. For some customers, a European plug was provided instead of a UK one – which is something to watch out for. This portable stereo is perfect for those who want to spend a little more when they go searching for their next CD player. While there have been a few cases where a European plug was provided instead of a UK one, the best way to try and avoid this is to be wary of who you buy the device from. Other than that, it works fantastically and provides a superb quality of sound that will leave you more than satisfied with your purchase. Not to mention the included remote and access to radio stations. If anything, Sony is the king of audio equipment and technology. After all, they are behind some of the most innovative portable designs. If you are in search of something good, but less than £100 in terms of price, this is the one for you. Take some time to read the reviews below. This portable CD player comes in stereo form and is available in three superb colours – black, white, and a pale blue. This is to ensure that you are able to find the perfect one to suit both your home and personal style. While it is in a larger form than some other portable CD players, it is very lightweight and easy to transport, which is ideal for visiting friends and family, or even going for a picnic/BBQ. The speakers are the kind of excellent quality that you would expect from Sony, and produce a clear sound that resonates perfectly. It plays each format of CD, and even has the ability to play MP3 tracks, so that you can listen to things like audiobooks without any hassle. 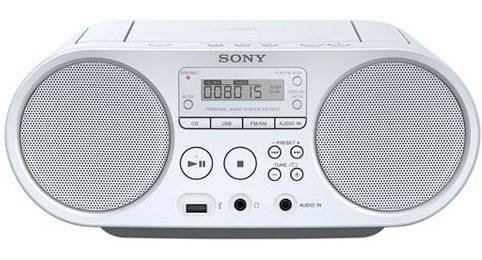 The controls are easy to use, and it can access FM radio stations, meaning that you will never miss your favourites. This portable CD player from Sony comes at a reasonable price that can fit into a good number of budgets, and it’s perfect for those who want to spend less than £100 on something that does the job excellently. With the ability to play radio stations, MP3 files, and your favourite CDs, it really does combine everything you could want and need into one neat little package. Not to mention that it’s very lightweight and portable. A good buy at a great price. This car stereo features a head unit that shines a brilliant blue when the power is on, giving your car a little more life. Alongside the provided ISO harness adaptor, it is very easy to install and will take no time at all. Plus, it is compatible with all vehicles – you just have to check the dimensions before you buy it for your car. It supports FM radio, as well as MP3, USB, SD, and AUX, and it also supports all forms of disc, allowing you to play all your favourite tunes. It’s also available at a pretty good price. 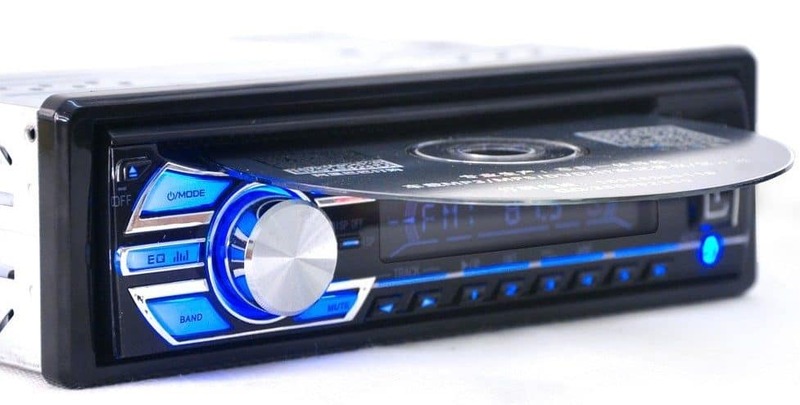 This digital receiver has a really cool and modern design, so you can add a little style to your car. It supports Bluetooth, so it can be linked up to your phone to play the music you love the most. In addition to this, you can also use it to pick up calls safely while you are on the move. The automatic memory function allows it to remember up to 18 radio stations, and it has four speakers so that you can make the most of your sound. It’s easy to install, and can fit into any car comfortably, just make sure you check the measurements before you buy this affordable radio. 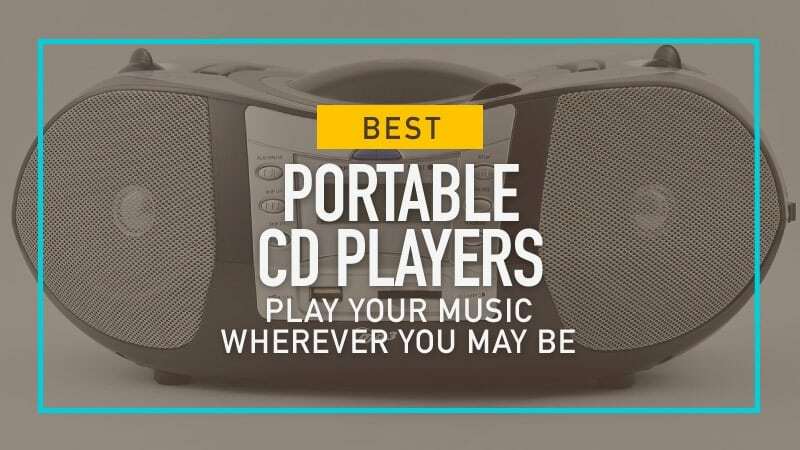 Hopefully, this guide has helped you to find the best portable CD player, so that you can listen to the music you love the most wherever you go. Whether you want something that is more like the Walkman of your youth, or a radio that will slot nicely into your car, there is one here that is sure to leave you with everything you need. Plus, they come in a wide range of prices, meaning that you can discover a radio that won’t break your budget (or your bank account). No matter what you are looking for, we are sure that you will find it here. What did you think of our portable CD player guide? Are there any that you would have liked to see or recommended? We love hearing from you, so make sure to leave us a message in the comments below.